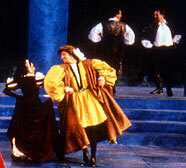 In Henry VIII, Shakespeare writes that Henry meets and falls in love with Anne Boleyn during a court dance. The director, Mary Zimmerman, asked me to choreograph a dance inspired bybut not limited toperiod movement that could tell that story. She wanted it to feel like the "last great moment" in the regime before Henry's world began to unravel. 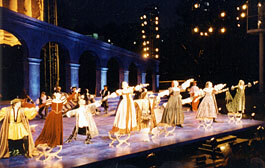 I heightened specific movements of Baroque dance (incorporating lifts and using set pieces in unexpected ways) and worked with the actors on the quality of their interaction in order to create a magical, romantic effect. At the same time, I sought to bring out the undercurrents of political intrigue at the court through the reactions of characters such as the disapproving Cardinal Woolsey. 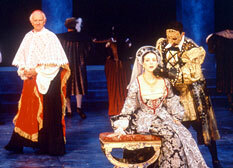 A videotape of Henry VIII can be viewed at the Lincoln Center Library of Performing Arts in New York City. To make a viewing appointment, call the Theater on Film and Tape Archive at 212-870-1642. "Notable for its visual sumptuousness...The configuring of the actors by Ms. Zimmerman and the choreographer Sabrina Peck often make for a luscious eyeful." "...and the crucial ball scene at Cardinal Wolsey's, where Henry meets Anne Boleyn, is beautifully done, and much helped by the stylish choreography of Sabrina Peck."